Housing prices could drop by up to 30% over 6 to 12 months after demonetisation, says T S Ramakrishnan. After demonetisation, a prominent economist tweeted that 19% of India's employment share contributed by the real estate sector will be jeopardised. It was also reported in late November that housing prices could drop by up to 30% over 6 to 12 months after demonetisation, wiping out over Rs 8 lakh crore of the market value of residential properties sold and unsold by developers since 2008. Such tweets and news items create at least two wrong inferences on the impact of demonetisation on the real estate sector. The first inference is that employment opportunities will shrink in the sector. The second is that wealth already created in the sector is being eroded. How far are these inferences true? The real estate sector has been in the grip of a slump for some time now, because of distorted prices, which make it impossible for even high-income groups to buy a house unless they have unaccounted money. Indian professionals earning well -- let alone average Indians -- are nowhere near being able to buy a house with a super built-up area of, say, 1,000 sq ft in a city at the prime of their lives. Mumbai leads other cities in price of property, which varies between Rs 1.3 crore (Rs 13 million) and Rs 2.9 crore (Rs 29 million). The price in other cities varies between Rs 30 lakhs (Rs 3 million) and Rs 60 lakh (Rs 6 million). 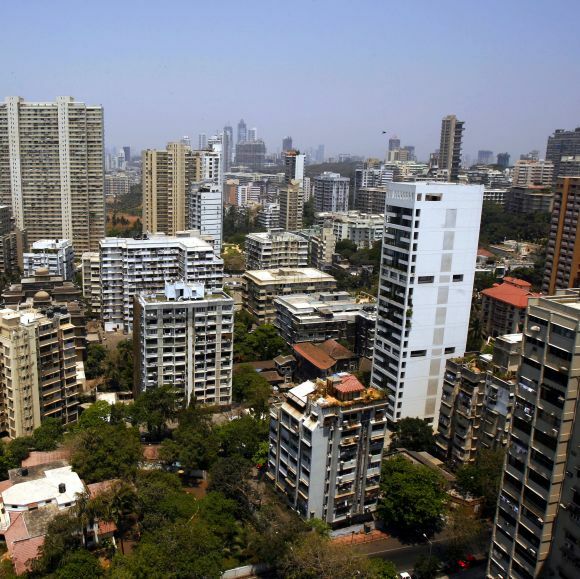 On the basis of per capita income, it may take 30 to 60 years for a Mumbaikar to own a flat. For residents of other cities, it may take 12 to 24 years. Since housing loans are provided in such a way that the EMI does not exceed 47% of monthly incomes, the EMIs may last for 60 to 120 years for Mumbaikars and 24 to 48 years for those in other cities. Advisory firms on housing even prescribe that those who don't earn at least Rs 25 lakh (Rs 2.5 million) a year should not seek to buy a house in Mumbai. In other cities, the minimum threshold is in the Rs 12 lakh to Rs 20 lakh (Rs 1.2 million to Rs 2 million) range, and those earning less are advised to rent a house. Even to generate the amount required for the down payment and stamp duty, an average Indian has to work for a decade or two. In this backdrop, people conclude that a rented house is a better option than buying a house. As a result, the inventory period of newly built houses went up from 23 months to 83 months in these cities. Despite such unsustainable inventory periods, builders did not reduce prices, taking new loans from banks and using them to pay back old loans. The business model followed by a sizable segment of the real estate sector is unsustainable, as the cash component of transactions is typically not less than 30% to 40%. With unaccounted money flushed out of the system, builders cannot expect buyers to buy houses at pre-demonetisation prices. The Real Estate (Regulation and Development) Act 2016, which has already been passed by Parliament and awaits enforcement by state governments, is like the Sword of Damocles for the real estate sector. Some of its features -- such as prices based on carpet area instead of super built-up area, and avoiding delays as 70% of money paid by the buyer should be in the respective project account -- make real estate projects more transparent and accountable. The saving grace for the developer in this act is that it is applicable only to new projects. In this context, builders have two options left. The first is to realise that this new normal cannot be changed, and to sell inventory at the earliest at a discounted price and pay back the loans that were raised from banks, thereby at least saving on interest payments. The second option is to wait for black money to accumulate afresh, so that property may be sold at pre-demonetisation prices or more. Given the huge inventory of houses and the intentions of the government in bringing all big transactions under electronic mode, the second option may remain a chimera. Either way, builders will lose part of the money they have extracted from buyers in the last two decades. The impact on those who bought houses in the last few years also needs to be analysed. Although such buyers will also take a hit, it also depends on the purpose of their purchase. If they have bought a house for self-occupancy, the depreciation in the value of the house, post-demonetisation, will not matter to them. Even selling the existing house and buying a new one cannot make much difference, as prices have come down across the board. However, those who have invested in a second house for capital gains in the short term will take a hit. However, this is the collateral damage that cannot be avoided, when huge disruptions like demonetisation, the digital economy and regulation comes into force. Any sector that is mired in corruption, black money and distorted pricing can hardly be reformed without a big external push. Demonetisation has paved the way for the real estate sector to clean up its act and start life anew. It is no exaggeration to say that it is a blessing in disguise for the sector, which must start on a clean slate and implement a sustainable business model. T S Ramakrishnan teaches at the T A Pai Management Institute, Manipal. 1 million UPI transactions a day!